As usual there will be no trains at all from mid-evening on Monday 24 December until 27 December (full details on Transport for Greater Manchester website) but for the days after Christmas (27-30 December) Northern Rail are running an interesting 'Anywhere on our system for £10' offer, detailed on their website - you have to register as a user, but some interesting excursions could be made. 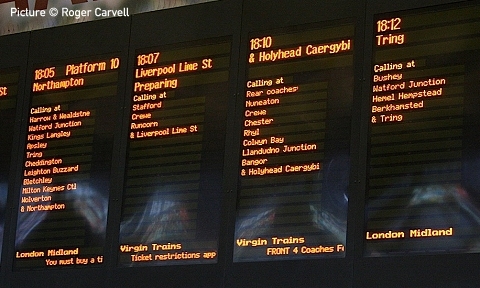 The offer is strictly for Northern Rail services, and not TransPennine nor any other operators, which calls for some creative planning, but by using local trains and changing it might be possible, for example, to reach Carlisle via Manchester Victoria, Huddersfield, Leeds and the Settle-Carlisle route. Have a look an the Network Map, and watch out for engineering works! In particular the work to enlarge Salford Crescent station will be disrupting trains passing that way. The tickets have to be bought from staffed stations, so you'll need to visit Davenport station when it's open (mornings, except Sunday and days with no trains) to present your form. Ken Millward, Davenport's helpful stationmaster, retired on, Thursday 6 December. We wish him all the best for the future on behalf of all regular customers. Join us for a seasonal Sunday afternoon in the park. Come listen to the music! ticket to support us and/or buy something from the Craft Stalls. 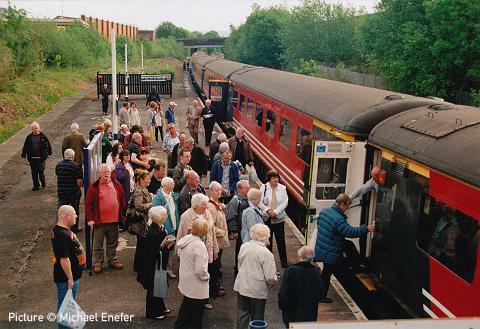 Some time ago, Transport for Greater Manchester promised to enhance our Sunday service by extending the two-hourly Southport - Stockport trains to turn round at Hazel Grove instead of waiting at Stockport before returning. After a false start last year, this service has now appeared in the new Timetable which starts on 9 December, and to our surprise, according to posters at the station, the additional trains already started running on Sunday 18 November. They do not stop at Heaton Chapel or Levenshulme. Extra departures from Davenport towards Manchester on Sundays are at 09:16, 13:16, 15:11, 17:17, 19:11 and 21:11. Note the variable times and the gap in the morning service. Return from Manchester Piccadilly is more regular at 12:22, 14:22, 16:22, 18:22, 20:22 and 22:22. All these trains use Platforms 13/14 at Piccadilly and also serve Oxford Road, Deansgate and Salford Crescent stations, which is useful. Exceptionally, however, from 6 January to 10 February they will run between Hazel Grove and Piccadilly only. Less welcome news about the new timetable is that the policy of running buses to Buxton in place of the last trains of the day, Monday - Thursday, to allow engineering work, has now been included in the timetable, and will happen every Monday - Thursday from the New Year until 31 March. However, it's not too bad for us in that the 21:52 and 23:10 trains from Manchester will run as far as Hazel Grove before handing over to a bus. 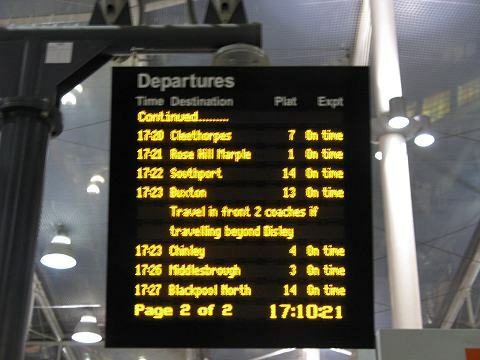 In the downhill direction, the 21:29 Buxton - Manchester (Davenport 22:04) runs as normal, and there will still be a train starting at 23:32 from Hazel Grove (Davenport 23:36) to Manchester, but passengers wanting the last train from Buxton (22:56) will need to travel all the way by bus, arriving at Davenport at 00:01. Days to be avoided if planning a trip to the Buxton Opera House, perhaps. The new timetable booklet starting on 9 December is available for download at Northern Rail. Apart from the above, there appear to be few if any changes to times except that with all the leaves having fallen (hopefully) departures towards Manchester revert to their normal, slightly later, times, including the irritating out-of-pattern times of 14:05 and 16:34. At about 9.45am on Monday 12 November 2012, an unknown offender entered the Royal Bank of Scotland on Bramhall Lane, Davenport. He produced a handgun from a bag, which he then pointed at staff while demanding cash. One employee handed over a quantity of cash and the man put it into his rucksack, exited the bank and left in an unknown direction. It is believed the same person is responsible for a similar robbery at the bank at about 10am on 7 November 2012. The offender is described as white, about 6ft tall. He was wearing a grey hooded tracksuit top and bottoms, baseball cap and wore tights over his head. The images above are from Davenport Station CCTV, showing him walking into the village (where from?) and then back again 12 minutes later. Anyone with information is asked to call Stockport CID on 0161 856 or the independent charity, Crimestoppers, anonymously, on 0800 555 111. Chance discovery of a postcard has resulted in a new local history article: 'A postcard from Oberhofen' researching the early history of a house on The Crescent. 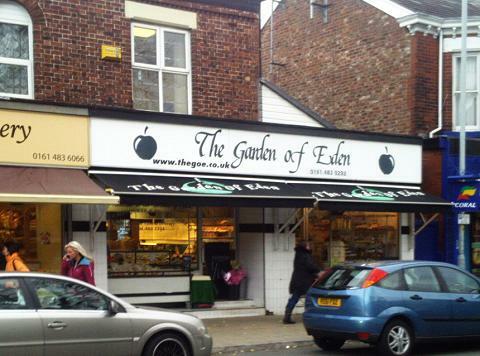 The 'Garden of Eden' greengrocery on Bramhall Lane, for many years a well-loved feature of Davenport, was selling off its stock at half price before its doors for the last time, with little advance warning to customers, on 26 October. It will be missed; we wish the staff well for the future. We hear that the shop will open again under new management, still selling fruit and vegetables; we await developments. Elsewhere, the 'Best One' convenience store on the corner of Ashfield Road also appears to be closed down, after after a short career, having over the old 'Thresher' premises in 2010. Opening right next door to another shop selling the same things always looked an uncertain prospect. Barwood's Fitted Bedrooms have taken on the old Baccasweet shop, so at least we'll be able to pop in and buy one of those on the way to the station. To contact BTP call 0800 40 50 40, or Crimestoppers, anonymously, on 0800 555 111. Since the opening of the system, Metrolink services from Piccadilly station to Altrincham and Bury have been provided by trams which start from Bury, run to Piccadilly station, decant all their passengers, reverse in the siding beyond the platforms, and re-appear on the other side as a service to Altrincham (and vice versa). Regular users will know that in recent times this has magnified delays and resulted in an irregular service - passengers for Altrincham sometimes seeing two departures for each of the other destinations depart before an Altrincham tram shows up. Metrolink have, we understand, now decided to do something about this by separating the Bury and Altrincham services, with the Altrincham line being run by trams based at the new Old Trafford depot. (The daytime direct service between Bury and Altrincham, avoiding Piccadilly, in unchanged.) Will this help? We sincerely hope so. Remember when Davenport had electric trains through to the Altrincham line? Bramall Hall closed to the public for a week, opening again on 15 September, for the filming of a TV drama, to be shown on ITV, called ‘The Making of a Lady’, based on the novel ‘The Making of a Marchioness’ by Frances Hodgson Burnett. Some changes are being made to bus routes in the Stockport area from 2 September. The principal one affecting our routes is that the 309 / 310 route is altered in Edgeley to run via Grenville Street instead of Chatham Street, York Street, Castle Street and Worrall Street, and the times are changed. See www.tfgm.com or obtain a timetable leaflet from the railway station. An interesting development elsewhere is that the recently-introduced shuttle service 9 between Salford Crescent station and MediaCityUK is replaced by an extension of Stagecoach Route 50 (East Didsbury - Albert Square) via Salford Central station to Salford Crescent and then the same route as the former route 9. However, connections at Salford Crescent station on the return journey will not be as easy as buses from MediaCityUK will not call at the stop outside the station, but on the Crescent. So - The Department of Transport has ruled that the contract to operate the West Coast Main Line network from 9 December 2012 until the year 2026. includin the London - Manchester route, is to be granted to a newly-formed subsidiary of FirstGroup, a combine which has its origin in 1989 when the council-owned Aberdeen municipal bus operator Grampian Regional Transport was sold to its employees in a deal led by general manager Moir Lockhead, and proceeded to absorb and merge with other bus companies, and, when rail franchising appeared on the scene, rail franchises too, after changing name in 1998 from FirstBus to FirstGroup. One of their former managers later rose to be Head of Railways for the Department of Transport, although he has since retired. We are used to the 'Flying f' logo and 'Barbie' indigo and pink livery in Stockport, of course - First North Western ran the services on our area now provided by Northern Rail, from 1998 until 2004, and today they are the leading partner (with the French State Railways having a smaller share) in First TransPennine Express. 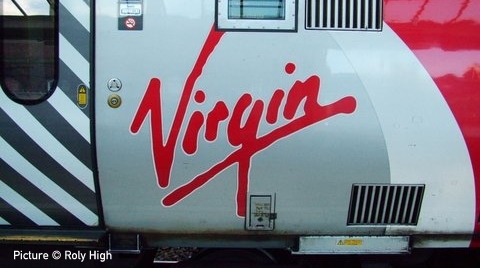 Recently, some of the First companies have gained a reputation for poor service, with much use of the unfortunate rhyme of 'First' with 'Worst', and Sir Richard Branson is, predictably, trying to stir up trouble by supporting a 'save Virgin Trains' online petition which is apparently signed by celebrities including Sir Alan Sugar and Eddie Izzard. Now there's an odd couple for you! It seems the actual signing of the contract is planned for 28 August. Desperate Virgin fans can sign the online petition, which appears to be 'trending on Twitter', 'going viral' and all that sort of thing, well past the 100,000 signature mark by the time you read this. But does it all really make much difference, when the trains and the staff will largely be the same? Meanwhile, FirstGroup has been explaining how it is going to raise the billions of pounds it has to pay the Government over the period while continuing to offer the same service. Their website tell us how they plan to do this, and their is also a Question and Answer page and a PDF Presentation to Investors which gives more detail. although with few dates against the items, and the usual talk of 'investment' in things which in truth will be leased. A surprise is the commitment to procure '11 new 125mph six-car electric trains' by 2016 which will work the Birmingham - Glasgow service that is currently run mostly by diesel Voyagers, even though it runs entirely on electrified lines. This will release the Voyager fleet (willl they keep the name?) for more capacity for North Wales and a service between London and Shrewsbury. Stockport and Macclesfield stations, currently run by Virgin, will pass to FirstGroup's company, but the people running the stations will no doubt stay the same. There is a promise to install automatic barriers, and bring in smartcard tickets, but this is in the future. Some things, like the future of your editor's favourite vegetarian breakfast - remain to be seen, as does the trading name they will be using for the operation. And they are a British company - until Scotland gains independence, at least. 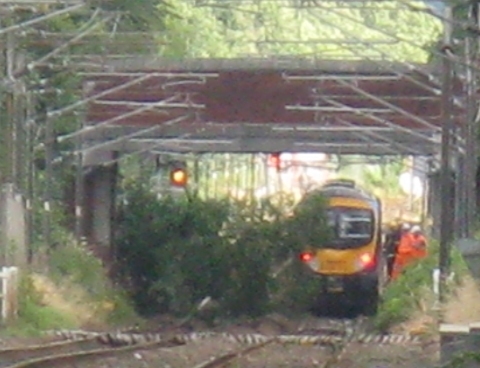 A tree fell across the line at Woodsmoor station at around 17:00 on 30 July (Picture taken from Davenport platform). Initially people for our line were advised to travel by service buses, later coaches were organised to replace trains between Hazel Grove and Stockport. The overhead wires were brought down, and although rarely used had to be repaired, as well as removal of the tree. These operations took the rest of the evening; train services resumed the following morning. Virgin Trains staff are organising another 'rail day' at Stockport station on Sunday 22 July from 10:00 to 16:00 to raise funds for the Clic Sargent charity for children with cancer. There will be model railways, sales stands, a charity raffle, and 'visiting locomotives.' As it happens there will also be a steam train calling at the station at 10:15 (note revised timing). This summer, three of the Railway Touring Company's 'North Wales Coast Express' steam-hauled excursions to North Wales are planned to be running via - and calling at - Stockport. The trains start at Crewe and will pick up at Stockport at 10:15 on Sundays 22 July, 5 August and 12 August, and set down at Llandudno, Bangor and Holyhead. The return train arrives at Stockport approximtely 22:30. Full details and booking on the Railway Touring Company website. There will also be a Railway Touring Company steam train, to Scarborough, picking up at Stockport at approximatly 08:20, on Friday 20 July. The July 2012 issue of Today's Railways UK magazine includes a feature article by Paul Salveson about the Manchester - Buxton line. 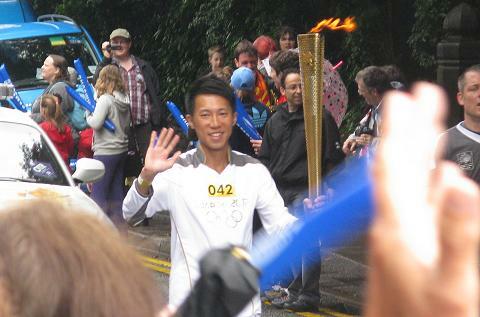 And after all that, he seemed pleased to run his short stretch through south Stockport. 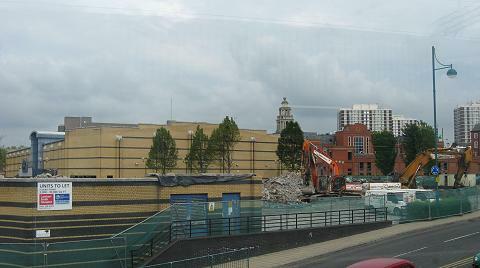 Above: on 21 June, diggers are loading into lorries the last remains of the Grand Central ten-pin bowl, part of the complex which, along the the 'night club' and the pub, have been demolished to make way for new developments. These buildings have had a short life, having been built since we came to Davenport in 1985. The first new building will be a multi-storey car park and 'cycle centre', followed later by a commercial office block, new public space, a new hotel and more highway and public transport improvements by 2015. Phase three will include a further three office buildings, extension of the open space and further improved accessibility for pedestrians by 2020. 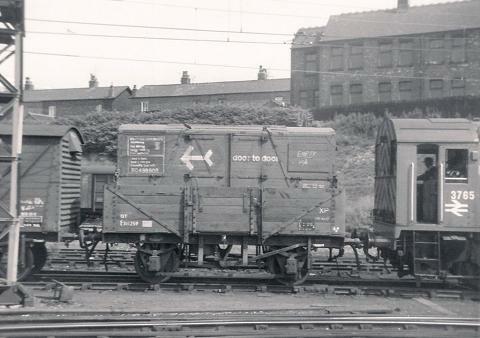 Before the 1980s, the area served as Stockport station's goods depot, as this pictures from c.1970 show. Above, shunting loco 3765 shunts wagons under the 'Goliath' gantry crane which would have been deployed to remove the 'door to door' container from its wagon for transfer to a lorry. This view shows sister loco 3769 pausing between duties, with in the background the 'coal drops' from which coal was delivered through openings in the track to a storage area below. This was the last of the goods facilities to survive, being used occasionally until the 1984-5 miners' strike. The Department for Transport (DfT) has extended the contract for Serco and Netherlands State Railways subsidiary 'abellio' to run the Northern Rail network from September 2013 until 1 April 2014. It is reported that the company made a pre-tax profit of £40.1 million last year thanks to the DfT grant of £339 million. Perhaps some of it will go towards improving train services ... in Holland. To be fair, improvements in Britain are also promised: read about then on the Northern Rail website. The extension should cover the completion of at least some of the electrification projects now under way - the first will be from Deansgate to Newton-le-Willows which will allow Manchester Airport - Scotland trains to be run by electric trains, some of which have been ordered for the purpose. It appears that the DfT are considering whether in the future Northern Rail and TransPennine Express should be merged into one organisation. A new national timetable period begins on 14 May. Leaflets for our line are now available from the station; there appears to little or no change to times of Davenport trains; all the annoying oddities remain, such as the 14:05 and 16:35 trains to Manchester being a few minutes earlier than the regular times of :08 and :37, just to catch people out. However there may be changes on other lines - check your journey before travelling. This year the Railway Touring Company are running some of their popular 'North Wales Coast Express' steam-hauled trains via a new route from Crewe, calling and Wilmslow, Stockport and Manchester Piccadilly. These are planned for Sundays 22 July, 5 and 12 August, and will take you to Llandudno, Bangor or Holyhead. Full details and booking on the Railway Touring Company website. A man who climbed over a railway footbridge and pulled down electrical wires to avoid paying for a ticket sparked a British Transport Police investigation. The actions of the man, who climbed from platform one to platform two at Hazel Grove, resulted in more than 445 minutes of delays in the area as the wires he pulled down caused a power cut. The incident happened shortly after 11am on Friday, 13 April. PC Mark Haviland said: The actions of this man were dangerous and foolish. It is hard to believe that anyone would put their life at risk to simply try to evade paying a relatively small fare. He risked falling onto the tracks and, by bringing down the power lines, severe electrocution – yet it is clear he was determined to avoid paying his way. A long-awaited innovation is a Sunday morning train service to local stations on the Macclesfield line. The 08:50 Manchester Piccadilly to Macclesfield calls at Stockport 09:01, then all stations to Macclesfield. The 11:41 Manchester Piccadilly to Macclesfield calls at Stockport 11:51, all stations to Macclesfield, then Congleton, Kidsgrove and Stoke-on-Trent. This is the first time that such trains have operated on Sunday mornings for many years. Unfortunately connections from the Davenport direction are not good, but cyclists in particular will find the services useful. A new bus operating company has been formed as a joint operation of the owners of Bowers of Chapel and TrentBarton's Dove Holes-based services, to be known as High Peak Buses. From 1 April they will be operating all the routes of the two companies, including the 'Skyline 199' and 'TransPeak' services which serve Stockport along the A6 Road. No changes to timetables are expected at this stage. 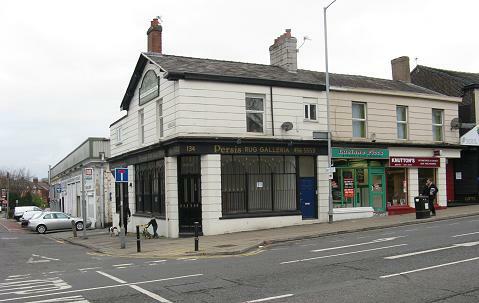 Time for another change to one of Davenport's more conspicuous buildings as the Persis Rug Galleria moves out to its new home in Heaviley on the corner of Hallam Street and the A6. When we first came to live here in 1985, this was a shop called 'Baccasweet' which served cakes and sandwiches to passers-by the workers from the nearby garages, with a smaill antiques business in the extension at the rear. Later, it became a shop selling assorted fancy goods, and then a furniture company. A business with the name 'Baccasweet' had existed for a long time: the name can be made out in the archive picture (above) taken at the time of the 1933 road-widening works. It appears they also offered a Library service. 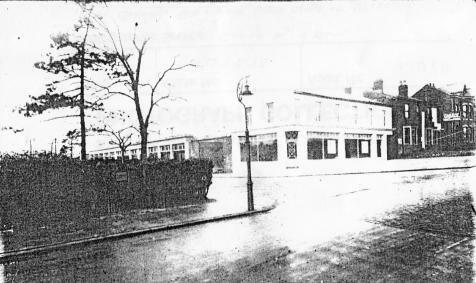 However, the building had been converted from ordinary houses a few years before, and (we believe) formed part of the same business as the garages behind, as seen in this 1929-dated view. The white rendering of the frontage dates from that time, when it was maybe thought that people with cars would pay to have them stored in the garages (equivalent to a livery stable) when not in use, and kept maintained. Older residents recall that cars were even parked on the flat roof of the garages. During World War II, the garages were used by the US Army. 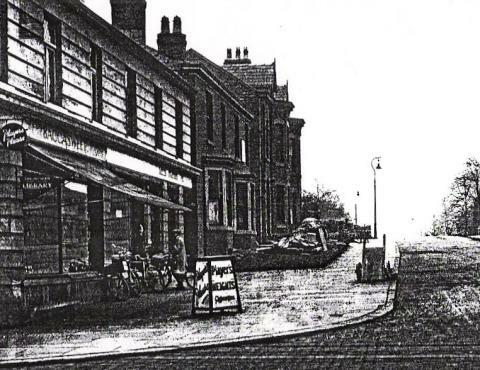 Any information about the early days of these buildings and the garages would be welcome. Trains through Stockport were all brought to a stand on the evening of Monday 12 March following what the railway's Twitter operators call a 'person hit by a train'. Tragic incidents of this sort - often either suicides or trespass - as well as level crossing collisions and lorries striking bridges, have become an almost daily occurrence on the railway network, and there is little the railway companies can do about it. The Mid-Cheshire Rail Users' Association tell us that there are still seats available for their next diesel-hauled railtour to Lincoln, Wainfleet (Bateman's Brewery Tour) and Skegness on Saturday 5 May 2012. In both directions, this train will call at Chester, Mouldsworth, Cuddington, Greenbank, Northwich, Plumley, Knutsford, Mobberley, Hale, Altrincham, Stockport, Reddish South & Marple for passengers in both directions. Full details and on-line booking on on the MCRUA website. Reddish South, which famously sees just one 'ordinary' train per week, was visited last year by the MCRUA's excursion, and over 30 passengers joined there, as pictured above by Michael Enefer. The station has a very active Friends Group. 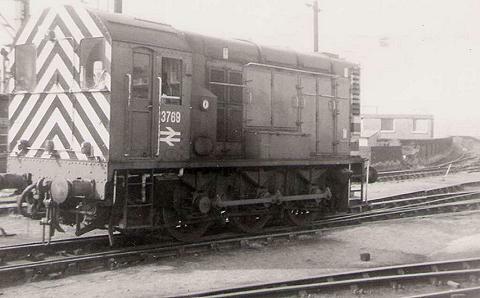 The reason for the 'front two coaches after Disley' (below) is that the platform at Whaley Bridge is being rebuilt. As for the 'mixed-up train' 150 210 shown in the view lower down the page, the picture is already historic, as this train has now been repainted in full Northern Rail colours, while retaining its rather tatty Central Trains interior furnishings. A new article in our local history section tells the story of the Bullock Brothers, whose photographic and postcard business operated in Stockport from the early 1880s to 1907. If you were interested in our research about Davenport-based painter James Patchell Chettle, you may be interested to know that one of his works, 'Above the Valley' is uncluded in the current landscape exhibition 'A Green and Pleasant Land' at Stockport War Memorial Art Gallery until June 2012. Visit the Gallery website for opening times and other details. 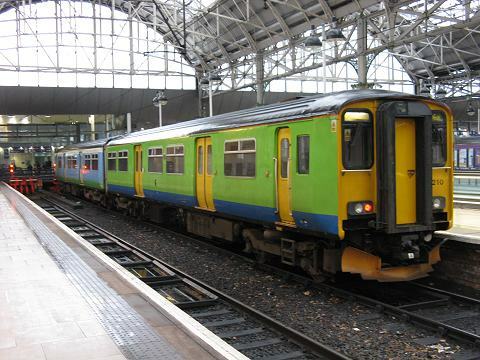 The Class 150 trains recently transferred to Northern Rail were a mixture of two variations of the Central Trains / Network West Midlands colour scheme, and some of them were in 3-car formation. Re-arranging them into 2-car sets for use in our area has resulted in at least one pairing - 150 210, seen above at Manchester Piccadilly - with its two cars in different colours. Some of the hand-me-down units have now received Northern Rail names and logos, but with the franchise due to end in September 2013, will they be repainted in Northern colours? The cheaper fares apply all day on Saturdays, Sundays and Bank Holidays. Note that southbound they can be used the 09:09 train from Davenport to Buxton on Mondays - Fridays. Note: the train is much cheaper than the bus for an off-peak journey to Stockport, where a free bus (every 12 minutes weekdays) will take you from the station to points in the town centre. Regular commuters travelling before 09:30 should consider buying a weekly, monthly or annual Season Ticket, or a System One Travelcard if your journey also involves a bus. These give a saving, and can be used for leisure journeys as well. There are some ways in which you can travel even more cheaply at off-peak times. The Northern Duo scheme, for example, for two adults travelling together, gives two return tickets for the price of 1½ between selected stations, e.g. Davenport to Buxton return £13.20 for two. If you are travelling after 18:30 and outward before 21:30, Cheap Evening Returns are available to most local stations at half the normal price, valid for return until the last train of the day. So if you travel into Manchester on the 18:37 train, for example, and return on the 23:10 from Piccadilly, the return fare is only £1.55. If you are travelling beyond Manchester, the Greater Manchester Rail Day Ranger at £4.80 gives a day's unlimited rail travel after 09:30 anywhere in Greater Manchester after 09:30 (all day at Weekends and Holidays), and also has a half-price evening version for £2.40. This can sometimes usefully be combined with another ticket from the boundary station if travelling further afield, particularly towards Southport and Blackpool, provided your trains stop and the boundary station. The Greater Manchester concession pass for the over 60s is the equivalent of having a free Greater Manchester Rail Day Ranger every day - and gives free travell on trams and buses as well! Many other options are available - the Transport for Greater Manchester website is a good place to look, or just ask for advice at Davenport station booking office which is open Monday - Saturday mornings. Tickets for any National Rail journey can be bought from Davenport station, 'on the morning' or in advance, but as there is only one person on duty it's a good idea to arrive at a quiet time if you have a complicated request. Quarter to, or quarter past the hour, is ideal.